With or without the moon. 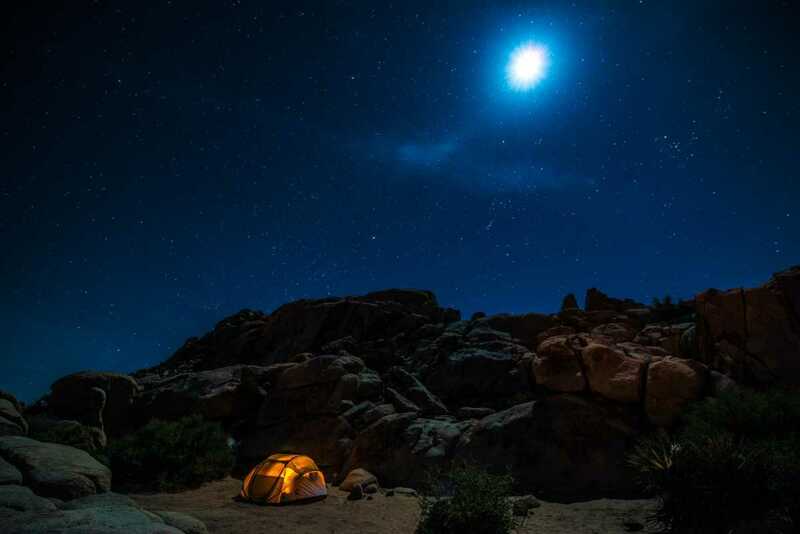 That’s the question in this nighttime shot in the Joshua Tree desert. I was thinking about setting up to make just this shot when I noticed that my fellow camper Josh (or was it Michael?) had already put a lantern in his tent and set up his tripod. So, since he already had the best spot, and the constellation Orion is my favorite, I just hitched a shot, so to speak. I did contribute a bit to the process, however, because I knew that starlight is a certain color temperature–3700K or so, so we were able to manually set that in camera and get it right. I made several exposures, both with my 24-70 lens as wide as it would go. But if I wanted to get the moon in the shot, I had to go wider, and so got out the 14-24, and the moon shot was the result. The one without the moon has its attractions, as well. Here’s another exposure that I like, without the moon. I like the foreground better in this one. Unfortunately, even with the wide angle lens set as wide as possible, I couldn’t get the foreground the way I liked it and the moon in the same shot. But, as Ansel Adams once said, a series of photos of essentially the same subject with minor variations is not necessarily a bad thing. Or something like that. And, of course, in this beautiful site, I wasn’t the only one taking pictures. 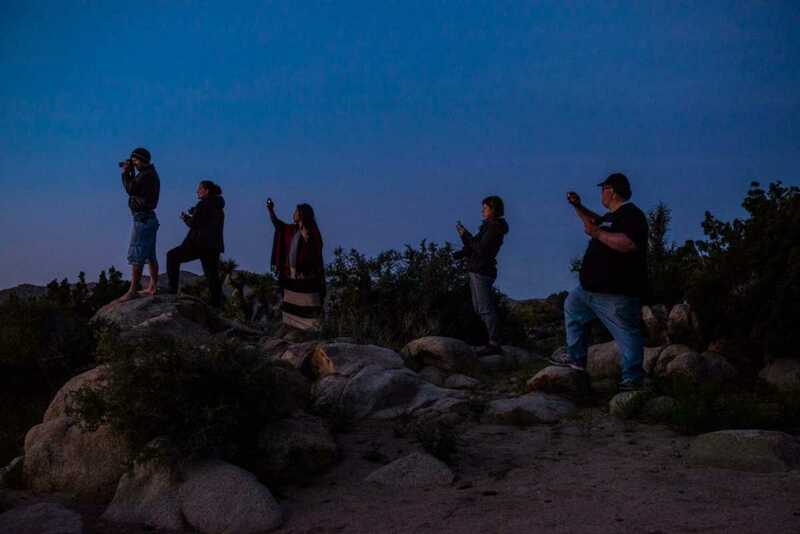 And, while we’re sort of discussing a bunch of photographers taking the same shot, I made this photo of five of my fellow travelers shooting the sunset an hour or so before we were working on the night sky. I’m sure they all got some great shots. It’s hard not to in Joshua Tree. And here is another photo shot on the same day, an hour or so earlier: Desert Sunset, Joshua Tree, California. I was part of a group of 12 travel bloggers who were kindly hosted by Mazda and James and Heather Hills of Mantripping.com for three days of camping in Joshua Tree and driving around the southern desert of California in really nice Mazda cars. What beautiful photos! I like the one with the moon in it best. Somehow it captures the feeling of being alone in the wilderness the best. Thank you, Rachel. 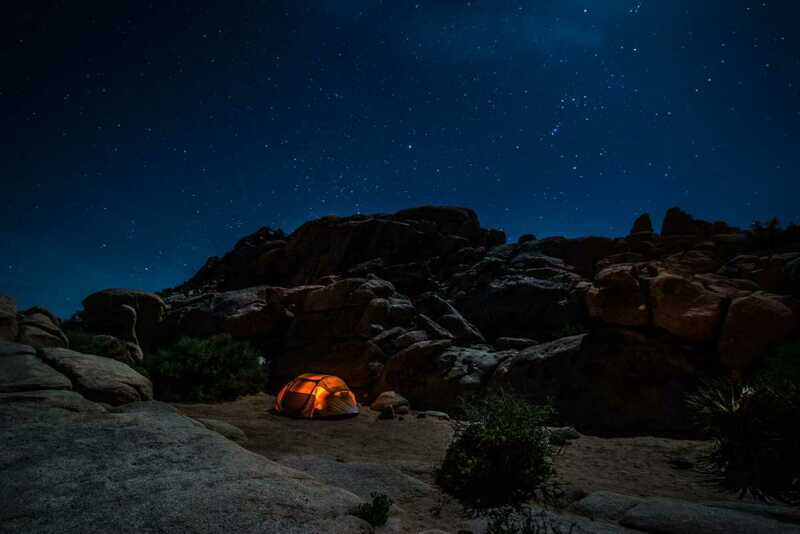 I do like camping when it involves staring at the stars for a while. I’d forgotten how cold the desert gets when the sun sets. Going from boiling to freezing almost immediately. But, wow, is it beautiful. Nothing like desert light. Looks like a fun thing to do for those beautiful night skies, I’ve wanted to visit the area and do the same thing some day. Noel, I’ve made some of my favorite photos there. It’s a spectacular place. Thanks, Al. Serene is a good word for the desert at night. Spectacular photos, Tom! Brings back memories of my camping trips in Minnesota and Wisconsin. Although the scenery and climate is different from Joshua, star gazing was always my favorite along with building the perfect fire. Some gorgeous photos there, I’ve driven past the area but never camped. Looks like something I may decide to do in the future. Thanks, Carolyn. It’s a beautiful spot and it’s pretty easy to camp there. It’s cold at night, though. Be sure to take a good warm sleeping bag.